A Map of the Butte Priority Soils Operable Unit (BPS OU) and associated OUs in the greater Silver Bow Creek/Butte Superfund site from the 2006 Record of Decision (ROD) for the site. Note that many OUs are located within or adjacent to the larger boundary of the BPSOU. EPA’s latest bulletin, from July 11, 2013, provides an overview of past and ongoing remediation work in the Butte Priority Soils Operable Unit (BPSOU), which includes most of the Butte urban area. Download the bulletin below. This EPA bulletin provides an overview of past and ongoing environmental remediation activities in the Butte area. In March 2013, EPA released the updated Community Involvement Plan (CIP) for the Butte Priority Soils Operable Unit (BPSOU). The updated CIP is available for download below or in the Ventolin side effects, or in hard copy at Get retin online and at the EPA’s offices in Butte and Helena. The Community Involvement Plan describes EPA's approach to public information and engagement in the Butte Priority Soils Operable Unit (BPSOU), which includes much of urban Butte. The plan was revised and updated in 2012-2013. British Petroleum subsidiary Atlantic Richfield (BP-ARCO) has provided a new website with information and data about the cleanup of the Butte Priority Soils Operable Unit. The purpose of the site is to provide current data to the public, including data on surface and groundwater chemistry, flow, and much more. Visit the new site at bpsou.com. The data at the site does not include much interpretation, so if you are overwhelmed or confused by the technical terminology and the meaning of the data, contact CTEC for assistance. BP-ARCO is the largest Potentially Responsible Party (PRP) liable for environmental cleanup in the Butte area. EPA issued a Unilateral Administrative Order (UAO) to the Potentially Responsible Parties (PRPs) for the Butte Priority Soils area in July 2011. A UAO is an enforcement tool that compels Potentially Responsible Parties to design and carry out cleanup actions. If PRPs do not comply, EPA can perform a fund-financed cleanup and seek to recover those costs from the PRPs . If PRPs do not comply, the Superfund law also authorizes a court to award penalties. As Consent Decree negotiations, the last step in planning cleanup, have dragged on in Butte for years, the UAO implements some parts of the Record of Decision (ROD, which can be downloaded below in the Past Cleanup section) for the site, while negotiations continue. Complete UAO documents, as well as an EPA Bulletin summarizing the UAO, can be downloaded below, or via the Ventolin side effects. A Unilateral Administrative Order (UAO) is an enforcement tool that compels Potentially Responsible Parties (PRPs) to design and carry out cleanup actions. If PRPs do not comply with a UAO, the EPA has the flexibility to determine whether to perform a fund-financed cleanup and seek to recover those costs from the PRPs . PRPs have a strong incentive to comply with UAOs, since the Superfund law authorizes a court to award penalties for non-compliance. As Consent Decree negotiations, the last step in planning cleanup, have dragged on in Butte for years, the UAO implements some parts of the Record of Decision (ROD) for the site, while negotiations continue. This bulletin explains the basics of a Unilateral Administrative Order (UAO), an enforcement tool that compels Potentially Responsible Parties (PRPs) to design and carry out cleanup actions. If PRPs do not comply with a UAO, the EPA has the flexibility to determine whether to perform a fund-financed cleanup and seek to recover those costs from the PRPs . PRPs have a strong incentive to comply with UAOs, since the Superfund law authorizes a court to award penalties for non-compliance. The most recent EPA Five Year Review Report for the site and associated appendices can be downloaded using the links below, or via the Superfund Library. The most recent EPA ground water data analysis report can be downloaded using the link below. A review and analysis of data related to contaminated groundwater in the Butte Priority Soils Operable Unit (BPSOU), which includes most of historic Uptown Butte. Cleanup at the Butte Priority Soils Operable Unit (BPSOU), which includes most of the surface urban area of uptown Butte and the community of Walkerville, has been divided into two phases. Phase I, an expedited Zithromax overnight, has addressed source areas by removing waste dumps, railroad beds, or other related mine wastes. These source areas were adjacent to or up gradient of receptor areas (residential yards, gardens, parks and playgrounds). Many waste sites were capped with clean soil through a “waste-in-place” treatment strategy that does not remove wastes. Such sites are evaluated on a rolling basis through the Butte Reclamation Evaluation System (BRES). The BRES is discussed in this EPA Bulletin from August 2010. Response actions that are part of Phase I continue. Mine waste, in the form of waste rock and fine-grained tailings, was scattered around the Butte hill over 100 years of industrial mining. The local government also runs a Prednisone 10mg that includes a lead abatement program that addresses children with elevated blood lead levels; residential yards with lead levels over 1,200 parts per million; residential homes with lead drinking pipes; indoor dust contaminated with lead; and interior and/or exterior lead paint. This is a five-year program administered by the Butte-Silver Bow Health Department with oversight by EPA. For more information on this program, call Eric Hassler at the Butte-Silver Bow County Health Department at 406-497-5042. Click here to download the Residential Metals Abatement Program (2010) as a .pdf file. The Prednisone 10mg is also discussed in this EPA Bulletin from March 2010. Phase II is currently underway, and includes an investigation to assess the actions already taken, all other areas of contamination, storm runoff, and future land use problems in Butte and Walkerville. Click here to read the final Municipal Stormwater System Improvement Plan (2011), prepared by EPA consultants Water & Environmental Technologies and Morrison-Maierle. Phase II culminated in a Record of Decision (ROD) in September 2006, which can be downloaded below or via the Ventolin side effects, or viewed at EPA’s Butte office (155 W. Granite), the CTEC office (27 W. Park St.), or the Montana Tech library. Other Records of Decision related to area Superfund sites are also available from the EPA website. 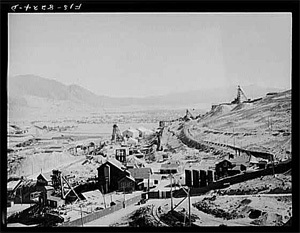 Mine tailings at the Colorado Smelter, which sat at the base of the Butte hill near Silver Bow Creek at the site of Lower Area One. 1988 – Walkerville (north of Butte): Stabilization of 300,000 cubic yards of lead-contaminated soil from mine waste dumps. Earthen basements (4) and residential yards (23) were cleaned up. 1989 – Timber Butte: Some 40,000 cubic yards of contaminated soil were moved to a temporary on-site repository in 1989. Two residential yards were cleaned up. 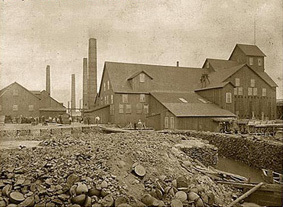 1990 – 1991 Priority Soils: Waste dumps containing about 100,000 cubic yards of soil were either capped or removed. A railroad bed and seven residential yards were also reclaimed. 1991 – Colorado Smelter: Approximately 40,000 cubic yards were moved to an on-site disposal area. 1992 – Anselmo Mine Yard/Late Acquisition Silver Hill: contaminated soils were removed. 1994 – Walkerville: Several waste dumps were either removed or capped. 1994 – Residential/Source Areas: Residential yards and waste rock dumps located throughout Butte and Walkerville have been/are being addressed. 1996 – Stormwater: Construction of cement channels and sedimentation ponds throughout the Butte hill to address stormwater contamination. 1999 – Railroad: Removal of contaminated soil on numerous railroad beds and rail yards throughout the Butte hill. This action should be completed in 2003 (EPA has provided no update on whether this completion date was met). 2000/2001 – Walkerville Residential Area: This action addressed 46 residential properties throughout Walkerville, MT. A more complete list of cleanup activities for the BPSOU, as well as other Operable Units, can be found at the EPA website, although it is somewhat out of date. 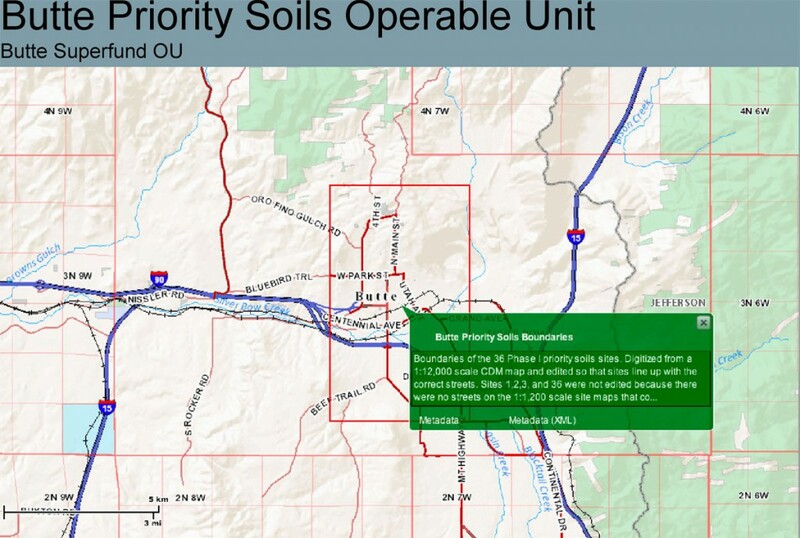 The approximate boundaries of the Butte Priority Soils/Residential Soils Operable Unit of the Butte Area Superfund environmental cleanup site. Map from Montana NRIS. 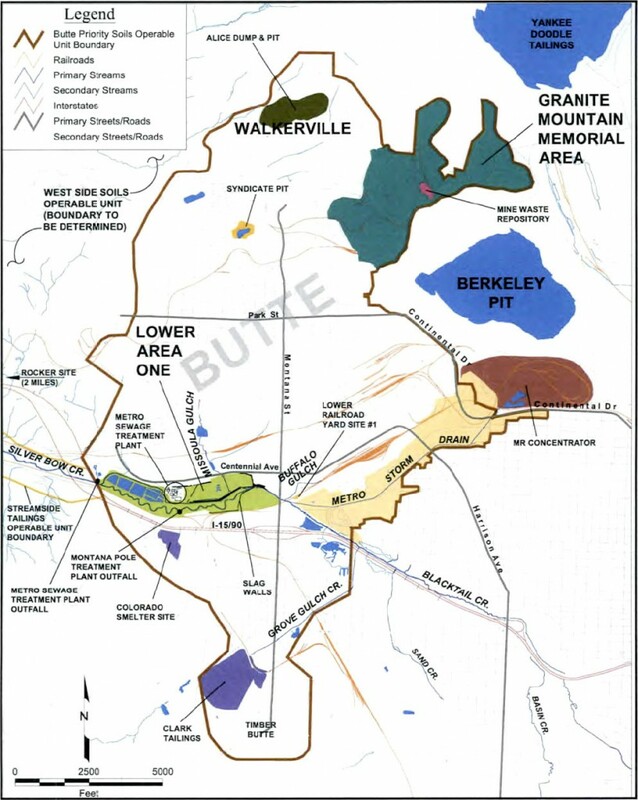 The Butte Priority Soils area is intimately connected to the Berkeley Pit and the flooded mines of the Proscar women, which addresses groundwater (as opposed to surface soils and water addressed by the Butte Priority Soils Operable Unit) in roughly the same geographic area. Both sites also effect the Streamside Tailings Operable Unit of Silver Bow Creek, which addresses mine waste along Silver Bow Creek downstream from Butte. Further subdivisions exist within the BPSOU, including the Online order acyclovir overnight delivery, Lower Area One near Silver Bow Creek, Butte Residential Soils, and the Travona Mine on the west side of Butte. Can you direct me to a figure that shows the SOIL LEAD CONCENTRATIONS in Butte, prior to remediation? Ideally, I’d like to find a contour map showing the different concentrations.